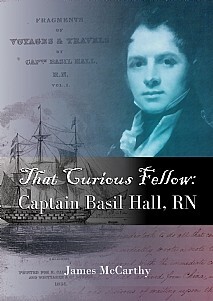 Son of a scientifically-minded Scottish aristocrat, Basil Hall joined the Royal Navy at the age of 13 in 1802. His first naval engagements in America and Spain during the Peninsular War are described, as are his travels in India and the Far East. His renowned interview with Napoleon, while still a prisoner on St. Helena is featured. He was a confidante of Sir Walter Scott, Dickens and many other distinguished authors of his day. Renowned for his curiosity and energy, he became a popular writer himself based on his world-wide travels and adventures, including his involvement in the liberation of Peru and friendship with General San Martin. He embarked on an epic, 10,000-mile journey with his family in North America and twice journeyed across the sub-continent of India under the patronage of the Admiral Sir Samuel Hood, providing delightful vignettes of Indian life of the time. Subsequent travels in Europe introduce personalities such as Lord Byron and the eccentric Countess Purgstall. Although the narrative of his journey in the United States earned him great opprobrium from Americans for his conservative attitudes, his support in Edinburgh to the great American bird painter, John James Audubon, was greatly appreciated by the artist. As an amateur scientist, Hall made important contributions to nautical astronomy, geology and naval technology, being a Fellow of both the Royal Society and the Royal Society of Edinburgh. Among his scientific friends were Sir John Herschel, Mary Somerville, and Sir Humphrey Davy, among many others. He was in the unusually privileged position of moving among the upper echelons of British society’s distinguished writers, scientists and politicians thus providing a fascinating insight into the mores and manners of high society in Edinburgh and London. The inclusion of previously unpublished and often revealing correspondence has contributed to the first full biography of a very colourful individual and his times. This fascinating book will be of immense appeal to everyone with an interest in naval history, exploration, travel, scientific discoveries and historical biographies.